Hugh Duvall is a Eugene attorney, but now he can be called something else: a downtown developer. 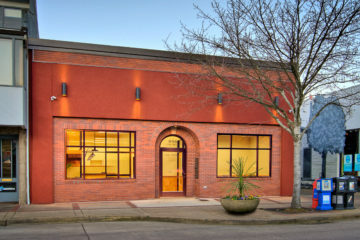 Duvall is renovating the former Bookmark building at 856 Olive St. to create a new office for himself and other lawyers. His building is a few steps from the two-block stretch of Broadway that has been considered for redevelopment during the past two years. Duvall, a 46-year old criminal defense attorney, bought the building from Broadway landlords Tom Connor and Don Woolley in December for $350,000. Connor, Woolley and Opus Northwest, a Portland-based developer, once thought of using the property as part of a large retail, housing and entertainment project on Broadway. Those plans fizzled, but the city has acquired options to buy many of the same properties that were sought by Connor-Woolley-Opus, keeping the redevelopment idea alive. Duvall rents an office in the Citizens Building on Oak Street. He had looked for a year for a building to buy near the Lane County courthouse. “I did have some reservations about buying the building because I did not want to stand in the way of a downtown redevelopment,” Duvall said. “But it’s not very often that a building within walking distance of the courthouse is available.” Duvall expects to pour $450,000 or more into a massive renovation of the 100-year-old building, originally called the Eugene Farmers Creamery. The building’s interior has been gutted to accommodate six law offices, one for Duvall and five for tenants. The buildings’ original window openings on the north wall, facing an alley and measuring about 4 feet wide by 7 feet tall, have been uncovered. They will be refitted with glass and glass blocks to let in light. A mezzanine will be constructed for storage space. Other interior treatments will include a vaulted ceiling above the lobby, Douglas fir beams, and steel and cable staircase railings. “It’s going to be a dramatic renovation,” Duvall said. The building’s purchase and redevelopment shows there is demand for small, reasonably priced downtown office buildings, said Sue Prichard, the commercial real estate broker who handled the sale for Connor and Woolley. Such buyers typically remodel the buildings and occupy them, she said. Recent examples of that trend include the owners of the Oveissi & Co. building at Broadway and Willamette Street, the Ulum Group building on Oak Street, and the KLCC building on West Eighth Avenue. Posted in Commercial, News, Publications.